Forum Index > Historical Arms Talk > Italian sallet in the 1370s? Posted: Mon 05 Dec, 2016 9:52 pm Post subject: Italian sallet in the 1370s? Do you have a link to the full item by any chance? I don't want to say anything yet, but indeed it looks to be misrepresented. Sorry about that this is my first post here. Mart - have you got an opinion on this one? 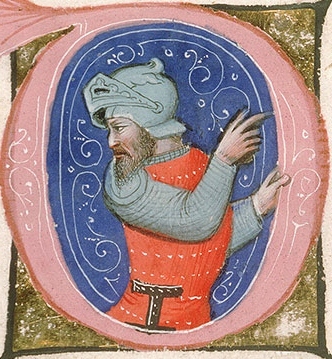 Some people consider this an early bascinet variant, with flared neck. That's pretty much what a sallet is, so I myself consider it a proper sallet. Thanks for the replies! On what basis is the painting that Mart shared dated to 1320? The style of art looks very different from early 14th century art. It's much more consistent with what we see closer to 1350 AD onward. The soldier with his visor raised up looks like he is wearing a coat of plates or perhaps a breastplate covered with fabric, rather than mail with a few additions as one would expect for 1320 AD. The Crucifixion of Pietro Lorenzetti is dated by various art historians between 1315-1330. The helmet in uestion is at the lower left. Fabric covered pairs of plates appear in the last third of the previous century, and are quite common by the 13-teens. Pesky time travelers. I often wonder if damage hasn't been painted over (a Siennese fresco c. 1340 showing uncovered breastplates provoked me to wonder), but that doesn't seem to be the case here. It doesn't seem to be depicted very well with the visor and funny thing on top, but as it dates from 1370 its not impossible that there were helms with a flared back edge, sallets had to come from some where after all. However it's nothing to go basing your next kit over.